How The FAA Flight Ban Came To Be . 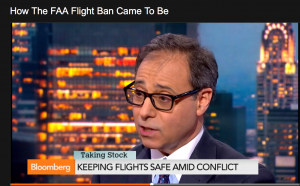 NEW YORK, July 25, 2014 /PRNewswire/ — New York based aviation accident lawyer Jonathan C. Reiter offered his legal perspective on the FAA’s decision to expand a ban on flights in conflict zones during a recent interview with Bloomberg. The decision was made by the agency after a projectile from Gaza landed near a major airport in Tel Aviv. U.S. carriers including United and Delta Airlines have cancelled flights to the country, and some international carriers are reportedly now following suit. According to Jonathan C. Reiter, of the Jonathan C. Reiter Law Firm, PLLC, this move is critical for airlines for protecting flight passengers in zones where there is political violence or other forms of ongoing conflict.